An Education in Facebook? 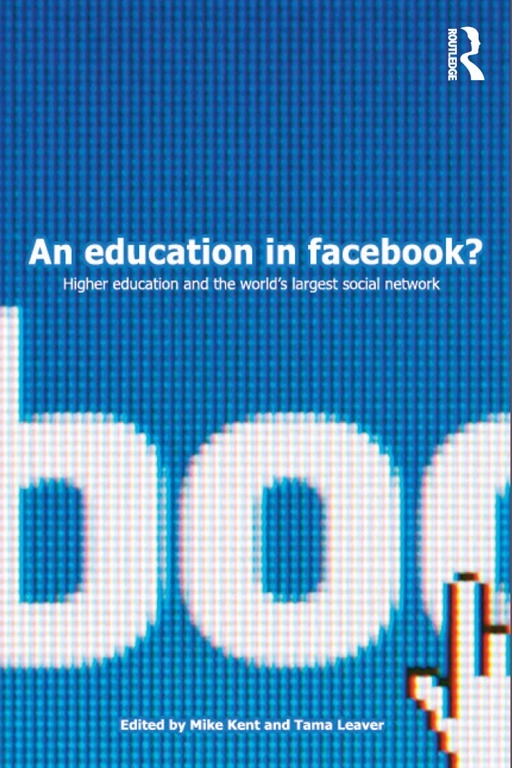 Higher Education and the World’s Largest Social Network edited by Mike Kent and myself was published by Routledge in May 2014. An Education in Facebook? examines and critiques the role of Facebook in the evolving landscape of higher education. At times a mandated part of classroom use, at others an informal network for students, Facebook has become an inevitable component of college life, acting alternately as an advertising, recruitment and learning tool. But what happens when educators use a corporate product, which exists outside of the control of universities, to educate students? An Education in Facebook? provides a broad discussion of the issues educators are already facing on college campuses worldwide, particularly in areas such as privacy, copyright and social media etiquette. By examining current uses of Facebook in university settings, this book offers both a thorough analytical critique as well as practical advice for educators and administrators looking to find ways to thoughtfully integrate Facebook and other digital communication tools into their classrooms and campuses. For further details, please see the Routledge website; a preview of the book is available either on the Routledge website (the first 30 pages) or on Google books. We’re pleased that the book has a reasonably priced paperback edition and is available widely, including at [Amazon] and [Book Depository]. "Facebook is still growing, is here to stay and has become part of the learning and social environments of students. For anybody working with those students this book is invaluable in helping to navigate your way through that environment." "The book is dedicated to students, and there is no doubt that their teachers would value its findings, and may well be inspired to become better teachers for having read it." "Mike Kent and Tama Leaver have assembled a compelling array of studies of Facebook which range widely in their analytical preoccupations. They render significant insights for educators, students and policy-makers alike. At times intensely practical and at others more deeply theoretical, this intelligent collection generally eschews technological determinism and poses all the right questions. In their editing, Leaver and Kent have kept true to a sophisticated view which positions pedagogy, student and academic engagement and issues of identity at the core. The dynamic interaction between learners, teachers and technologies, and abiding issues including identity, privacy and copyright, assure the longevity of this work in relation to Facebook, and beyond. I read it thirstily and will benefit from its richness. In a word? ‘Like.’"
"This excellent collection of critical work on the way Facebook influences and has become part of higher education is both timely and necessary. It brings together a series of diverse perspectives that reveal how online learning cannot be reduced to simplistic policies and standardised techniques but instead is the working out of the intricate patterns of desire, attention, information and identity that is, after all, the reality of all educational encounters. Kent and Lever and their contributors have produced a work of great value, that also tells us much about the way Facebook has changed human social interaction."